Was 99.99, 49.99, 39.99 now only 29.99 ! Limited stock. A definite deal on Ebay.... and a quid cheaper. Not guaranteeed to be instore at your local sainsburys.......A definite … Not guaranteeed to be instore at your local sainsburys.......A definite deal on Ebay.... and a quid cheaper. Well they claim they're new and unused, just not in original packaging..... also another online company doing this shaver for £30 delivered. Just a heads up for definite deals..... we all know how unreliable instore supermarket deals are. Just a word of caution to anybody thinking of getting one of these- the rechargeable batteries in it are not replaceable, so even if it isn't old stock it's not going to last all that long. Sadly Remington no longer make corded shavers. Worst shaver it's ever been my displeasure to own, from new lasted several weeks & hasn't held charge since! ...don't buy this false economy COLD AS HELL! 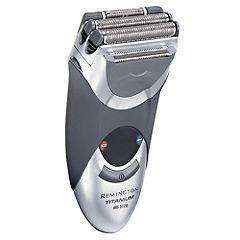 Remington MS5120 Titanium TRIPE Foil Men's Shaver. Boots claim that the shaver is exclusive to Boots - obviously not, except for their price £99.99! I think this one is £5 postage making it £30, also note the following text on the webpage. Please note: This item is reworked. The item will be in its original packaging unless otherwise stated. The condition of the item and/or packaging itself will be in as new condition with the possibility of the odd slight cosmetic mark. By this we mean a little scratch or small blemishes/marks consistent with minor handling. All items come with our 12 month replacement guaranteed for peace of mind we also have a 14 day money back return policy (P&P Not included). This is in addition to your statutory rights. Had this for over a year. Great shaver. Has never had any problems.